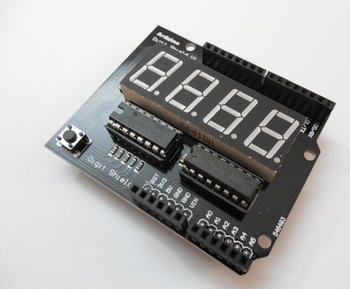 This shield uses a 4 digit, 7-segment display to give you the data you need. You can use it to make clocks, timers, show sensor data, or anything else you can dream up. If you would like to look at the schematics of the board I have put them on https://github.com/arduinolearning/Schematics-and-layouts/blob/master/digitshield_v1-0.pdf. I encourage you to look at the schematics to learn how this shield works, the main work is done by the 74Hc595 shift register and an IC that many may not have much knowledge of the 74LS247 BCD to seven-segment drive IC. The IC does have some limitations in that it can only really display the numbers 0 to 9 and a few strange characters which can be made up using the segments, so you can display text of any description on this.